The Stage - 5 October, 1933. 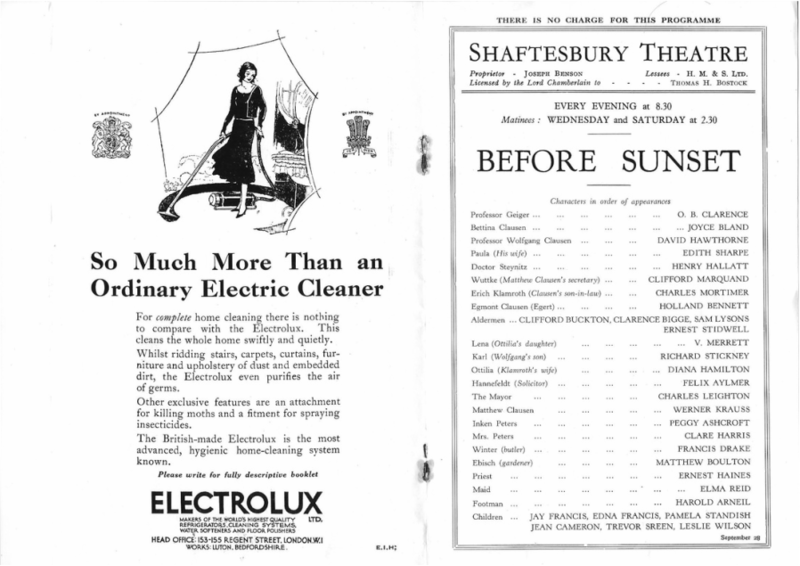 The Shaftesbury Theatre, London. "Mr David Hawthorne, Miss Edith Sharpe, Mr Henry Hallett, Mr Charles Mortimer, Mr Holland Bennett, and Mr Francis Drake also made definite contributions to an ensemble that was practically perfect." 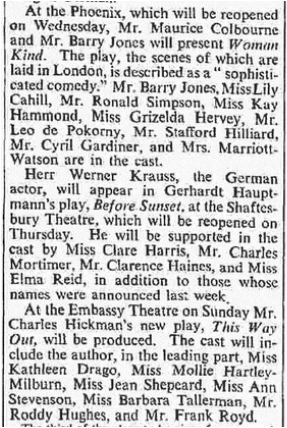 Charles Mortimer played Eric Klamroth in "Before Sunset" at the Shaftesbury Theatre, London, in 1933. The play ran from 28 March to 28 October. From The Era of 27 September, 1933. 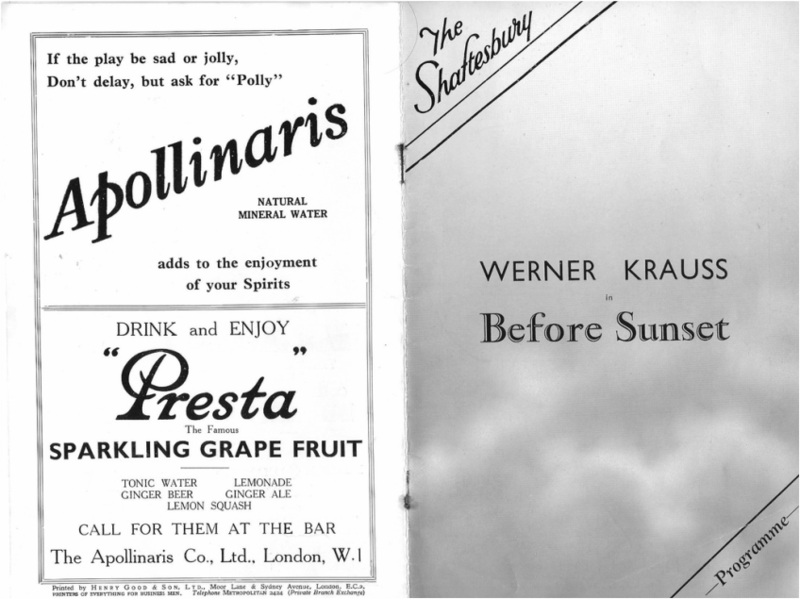 Stanley Scott announces the opening dale of "Before Sunset”, the play by Gerhard Hauptmann, in which Werner Krauss is to appear, will be at the Shaftesbury Theatre on September 28. 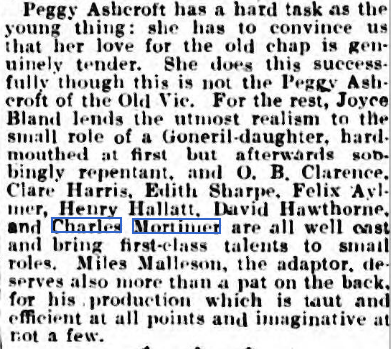 Clare Harris, Charles Mortimer, Clarence Haines and Elma Reid have joined the cast which includes: Peggy Ashcroft, Joyce Bland. Diana Hamilton, Edith Sharpe, O.B Clarence, Felix Aylmer, David Hawthorne, Henry Hallatt, Clifford Marquand, Matthew Boulton, Charles Leighton, Holland Bennett, and Francis Drake. Werner Krauss was the star of "Before Sunset". He had a poor reception from audiences due to his Nazi Germany sympathies, although fellow actors tried to back him for his acting credentials. Article from The Western Morning News and Daily Gazette on 29 September, 1933. The Tumult and the Play at the Shaftesbury. It seemed as thought he introduction of Herr Werner Krauss to a London audience at the Shaftesbury Theatre this evening might be indefinitely postponed. 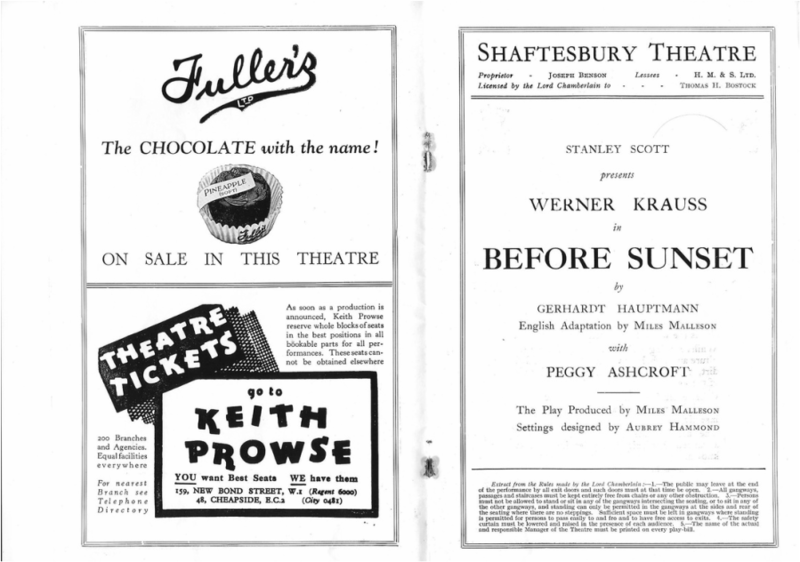 When the curtain rose on Mr Miles Malleson's adaptation of Hauptmann's "Before Sunset", some people in the gallery started to scream and throw down leaflets asking us to boycott German actors. It appears to be the offence of Herr Krauss that he is a German and not a Jew, and therefore we are to be so silly about him as anti-Semites are about Jews. After a few moments the unfortunate English actors whose cause was being thus absurdly championed started again - whereupon a gentleman had to be dragged from the dress circle because he would keep shouting that Hitler was a murderer. The next nuisance was the appearance in one of the uppermost boxes of a person who appealed to us to support the British actors only. When he had been put out the play was able to begin. Naturally, by this time everybody was in a high state of sympathy with Hauptmann, Herr Krauss, and even, perhaps, with Hitler and Hitlerism. Let us hope that this will be the end of such childishness, otherwise we shall have our theatres patrolled by black-shirted volunteers waiting to knock obstreperous people on the head and keep the merry game of boycott and rowdiness on the boil. 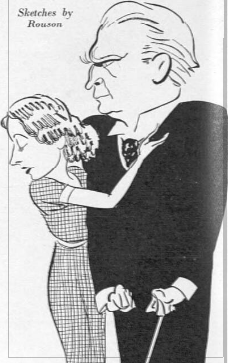 Hauptmann's play turned out to be a very slow starting story of an elderly and wealthy German publisher who had been idolising his dead wife for many years, and was now transferring his affection to a young girl. This naturally infuriated his family, who had expectations that the old man's estate would be "cut up" nicely and in their favour. At a formal family luncheon, where he tried to introduce the girl, there was a considerable storm over the soup-plates. Finally, the family endeavoured to have the old man certified as insane, whereupon he created the kind of scene which proves lethal at the right minute. It is not a profound play, but it offers opportunities for modern variations on certain aspects of King Lear. The old publisher can hover between the tender and the terrible. He has to die in the grand manner, and Herr Krauss, who acts in English, has a notable resonance of voice and a tremendous power of attack. English acting is nowadays so quiet that his lusty portraiture of rage came as a rare and refreshing change. His movements in the last act were finely significant of a life that was cracking within. His death-fall had an unusual sharpness; stage deaths are usually so false that this one seemed to come from nature itself. It is difficult to judge the acting after an evening has begun in conditions so ruinously disturbing to the nerve. 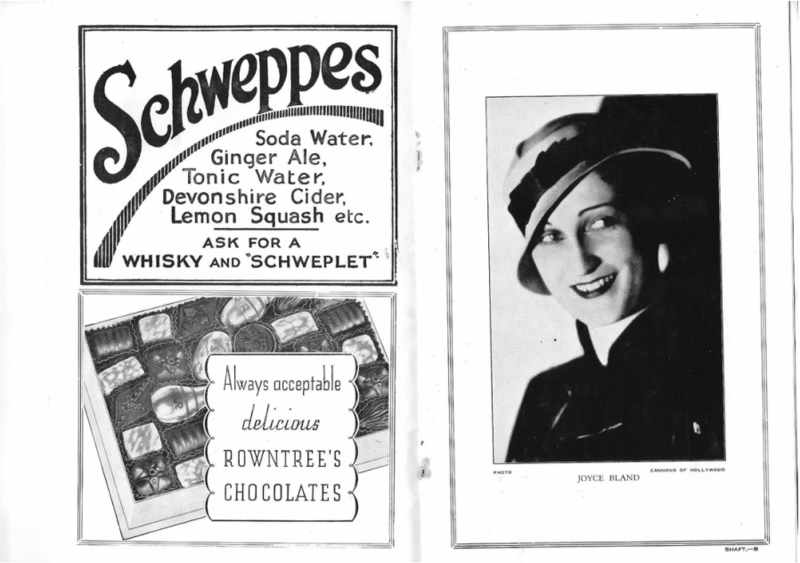 There were many good performances contributed by a large English company - Herr Krauss is the only German engaged - and Miss Joyce Bland, Mr Charles Mortimer, and Mr Felix Aylmer did uncommonly well. 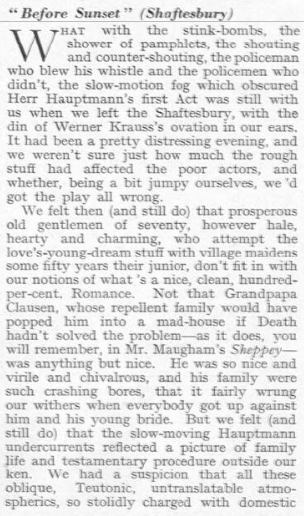 Herr Krauss seemed to be little disturbed by the antics upstairs, and he certainly carried the play, which is something of a burden, on his robust and resolute style. But it needs a piece of more range and less melodrama to persuade us that he owns the talent in any way unique. 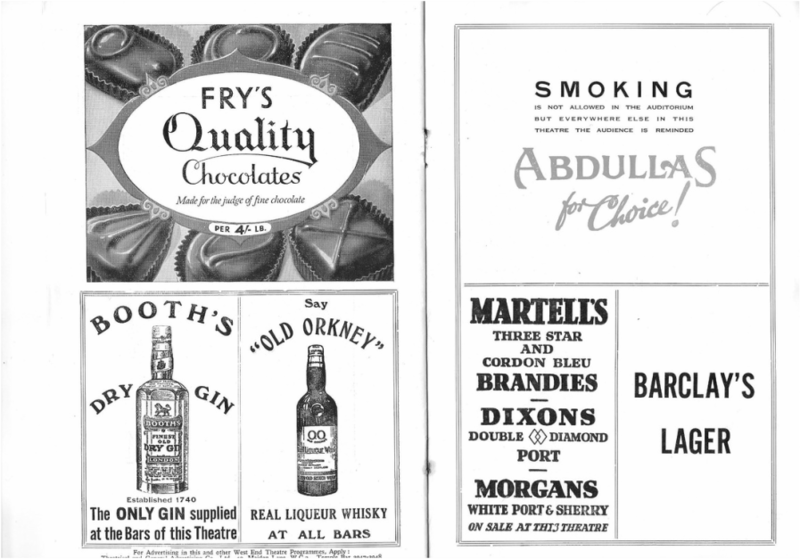 From the Western Morning News of 29 September, 1933. One of the most extraordinary scenes ever witnessed in a Western theatre occurred at the first night of Gerhardt Hauptmann's play "Before Sunset" the Shaftesbury Theatre last night, which Werner Krauss, the great German actor, made his first appearance in England. Twice, outbursts of hostile shouts, accompanied by a rain of leaflets from the gallery, made it necessary to lower the curtain. The opening demonstration came immediately after the curtain rose for the first act. At the entrance of Miss Joyce the young English actress, there were shouts from the gallery, and for a time scene the theatre was like Bedlam. Hundreds of leaflets were thrown down on to the people sitting the stalls and dress circle. There were cries "Down with Hitler." and "We won't let Werner appear." The leaflets bore the inscription:— message to Hitler through Werner Krauss. We want British actors for British plays, not Nazi actors. Boycott Hitler. Buy British." The jeers and shout's against Herr Krauss continued unabated and eventually the curtain was lowered. The demonstration did not end until a number of policemen entered the gallery and ejected a half dozen of the demonstrators. The curtain again rose, and the play performance was resumed. When Miss Bland, who had had to bear the brunt of the disturbance, again came to the stage, she could not make herself heard for the storm of cheers which greeted her. The audience stalls, which throughout the demonstration had been standing shouting, "shut up" and "sit down," gave her a tumultuous reception. Immediately Werner Krauss appeared on the stage, however, fresh outburst occurred in the gallery, and again the curtain had be lowered. The earlier demonstration was repeated, and more men in the gallery were ejected. 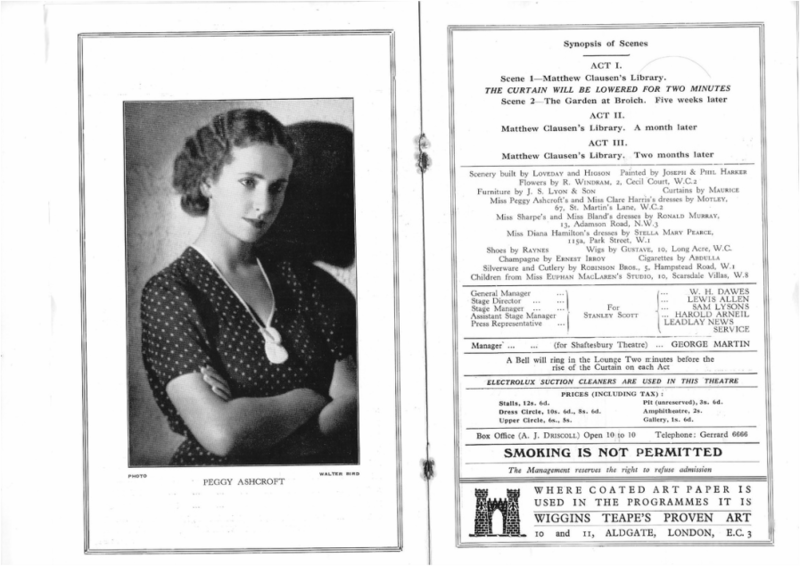 Miss Peggy Ashcroft, who was appearing in the play, then came before the curtain, to be greeted with a roar of applause. She murmured a protest against the demonstration, and went to say how proud she and the rest the company were to appear on stage with so great a man as Werner Krauss, The performance was then resumed. The setting of the first scene was the library of Matthew Clausen's house, the part of Clausen being played by Krauss. The play was adapted and produced by Mr. 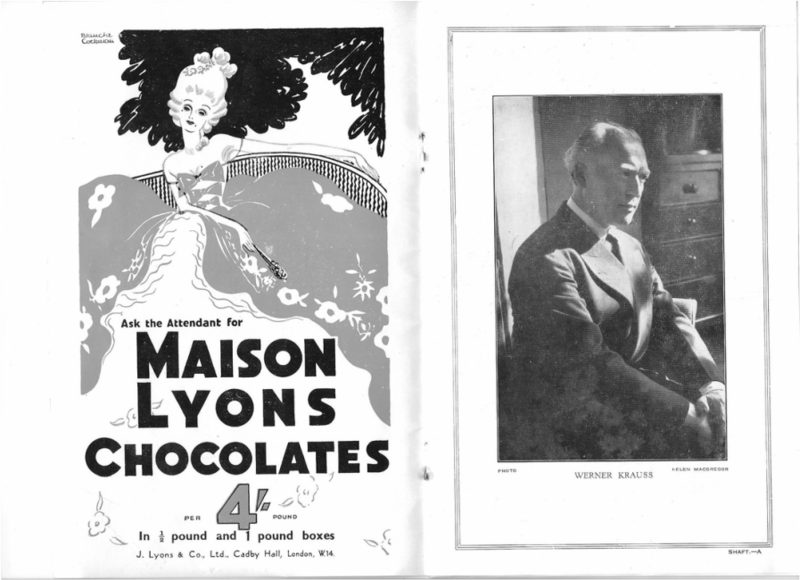 Miles Malleson, and among the cast are Mr. Felix Aylmer, Mr. Charles Mortimer, Mr. O. B. Clarence, and Miss Clare Harris. 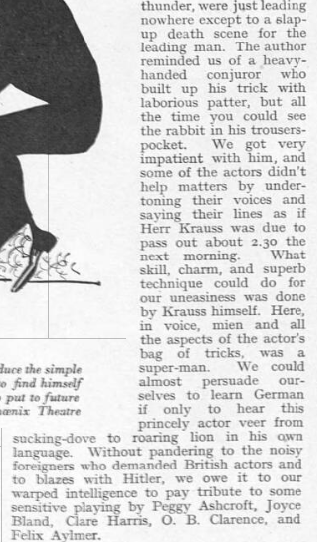 Werner Krauss, the star the Deutsches Theatre, Berlin, and the a schoolmaster, ran away front home as youth, and joined a travelling troupe, which toured the small villages and country towns. A theatrical manager saw him. and he was engaged to tour the leading watering-places and holiday health resorts in Germany. At Nuremburg the celebrated actor Alexander Moissi brought Krauss to attention of Max Bernhardt, who engaged him forthwith to appear in his Deutsches Theatre, and took him to America to play the Spielmann the Morrisgest production of "The Miracle." in which Lady Diana Manners first played the Madonna. Until his present visit to London, he has never been able to speak English. He had not previously left the Continent, except for an American trip. 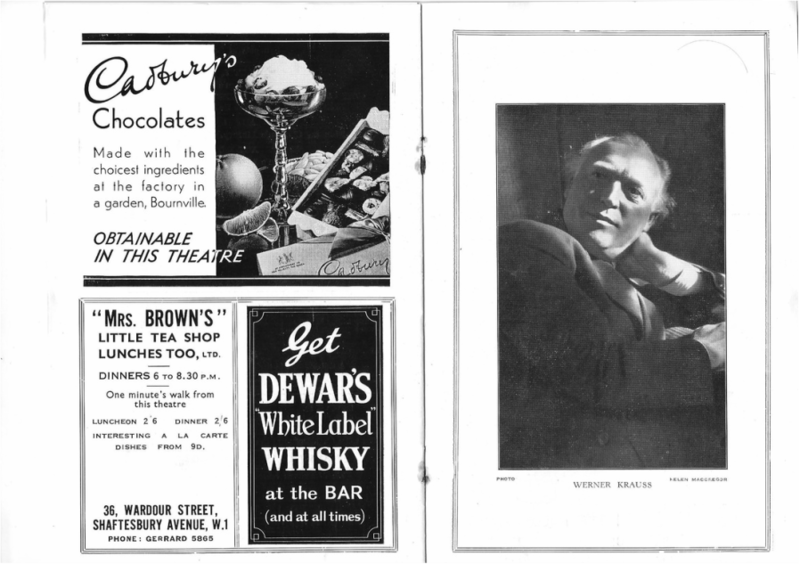 His range work has been immense, including all the great Shakespearian roles and most of the notable Shaw characters. He has been equally successful on stage and screen. Recently he appeared in two talking pictures, " The Man Without Name" and the comedy "The Captain Kopenick," He learned his long part in Before Sunset in three weeks.